According to the all-knowing Wikipedia, signage (which is what you have to search for unless you are super interested in the Zodiac) is defined as any kind of visual graphics created to display information to a particular audience. At Signs.com, we’re OK with that description – of course we would have come up with something much more spectacular, but that is another blog post. What we really wanted to know is where did signs come from, how have they been used and what were they made of in the past. As far as we know, the history of signage dates back to when man first figured out a way to express himself artistically. From the symbolic cave paintings of early human existence to the bright and modern digital city that is Tokyo, signs and symbols have always been used to communicate feelings, capture moments or advertise goods and services. Our first introduction into what we typically associate with modern signage is around the time of the Greeks and Romans. Usually made of stone or terra cotta, these signs used imagery more than text since many people were illiterate during this time. The signs depicted specific symbols to identify businesses like taverns and workshops that used raw materials like wood, leather, stone or metals. Early Christians used the cross to establish places to meet, while pagans used symbols like the sun and moon. After the Dark Ages ended and commerce expanded, the need for signs grew dramatically. 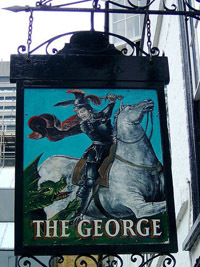 In 1389, King Richard III of England passed a law that any establishment that sold ale must place a sign out in front of its building. At first, these “trade” signs were fairly utilitarian, but soon signs where showing up with logos that included lions, dragons, shields and other popular symbols of the day. In order to keep pace with competitors, businesses realized that their signs needed to become more elaborate. Later, signs became larger and used more ornate materials. At the peak of “flamboyance” in the 16th and 17th centuries, signs were being created with hand-carved wood, wrought iron and gold leafing. As people increasingly began to congregate in cities, signs actually became a danger. Roads in urban areas were small and crowed with people, street vendors, animals and carts. Ordinances were established to control the size and placement of signs. In the 1700’s, both London and Paris introduced laws that forced signs to be removed or fixed flat against the wall. World War II ushered in the time of mass production. Improvements in plastics made it easy and affordable to print larger quantities of signs. The creation of changeable signs (you know, the ones with the letters that always have funny misspelled words on them) gave businesses the opportunity to mix and change messages using a single sign. Today the sign industry is an estimated $50 billion dollar a year industry. There are hundreds of printable materials, colors and sizes. With all the changes and new technologies, one thing remains constant. Signs are still used as an effective way of communication. You just have more options!